Some local schools are providing an opportunity for shoppers to skip the malls on Saturday in favor of holiday boutiques and fairs. At these fairs, you can support New Orleans children while crossing items off your Christmas shopping list. At the same time, you can second-line with Santa, buy a tree or wreath in a Magical Forest or let it sneaux at a French market while listening to Little Freddie King. 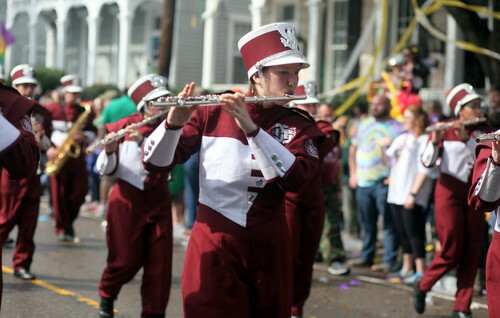 The schools holding fairs Uptown on Saturday include De La Salle High School, the Waldorf School of New Orleans and Lycée Français de la Nouvelle-Orleans. The De La Salle High School Cavalier Band will host “Breakfast With Santa and Holiday Boutique” on Saturday, Dec. 1, from 8:30 a.m. until 1 p.m. Santa arrives in style by streetcar at 9 a.m., followed by a second-line to the Dining Hall. The cost is $15 per person in advance or $20 per person at the door. Admission includes a breakfast buffet, arts and crafts, live music by the award-winning Cavalier Band, and more. Professional photography packages from Barberito Photographers, specialty food items, and adult beverages will be available for purchase. The breakfast (8:30 a.m.-11:30 a.m.) will be held in the school’s Dining Hall, to the rear of the main school building at 5300 St. Charles Avenue. In addition to Breakfast with Santa, a special Holiday Boutique with great holiday gift selections from local vendors will be open from 8:30 a.m. To 1 p.m. Guests wishing to attend just the Holiday Boutique may do soat no cost. Proceeds from this event support “The Pride of the Avenue,” the De La Salle Marching Band. The Waldorf School of New Orleans is holding Winter Faire on Saturday, Dec. 1 from 10 a.m. to 4 p.m. its campus on 517 Soraparu St. The fair includes candle dipping, crafts, fresh baked goods, handmade gifts for sale and a lovely puppet show. Plus there will be trees, wreaths and garlands available for sale at the Winter Faire Magical Forest, complete with snow machine and our very special Giving Tree. Waldorf School of New Orleans serves 140 students ranging in age from nursery through eighth grade at two campuses, our K-8 campus at 517 Soraparu St., and our Early Childhood Center at 2010 Peniston St.
La Liaison du Lycée Français de la Nouvelle-Orleans will host its annual French winter market, Marché D’Hiver, on Dec. 1 from 10 a.m. to 4 p.m. at its Priestley campus, 1619 Leonidas St.
All proceeds of the annual fundraiser benefit Lycée Français de la Nouvelle-Orleans, a type 2 charter school. In 2017 over $35,000 was raised through this event and aided payment for programs such as “Thinking Outside the Classroom,” teacher materials, enhanced technology and enhancement of the school’s campuses. At the market, the traditions of France are given a New Orleans twist. It features 25 local artisans, multiple food vendors (including Empanola, Crêpes à la Cart, and Reginelli’s) and plenty of beverages including beers, daiquiris and champagne cocktails. For the kids, there will be lots of games, crafts, prizes, cake walk, “pie in the eye”, a bounce house, maze and our very own “sneaux” filled winter wonderland. In addition, each classroom has put together themed raffle baskets that will be raffled off throughout the day and school spirit merchandise will be for sale. It wouldn’t be a New Orleans celebration without music. Lycée students will be performing throughout the day, there will be a special guest appearance by New Orleans legend Little Freddie King and a D.J. dance party will close out the event. Lycée Français currently serves 939 children in grades pre-K4 through eighth grade. Each year a grade is added, culminating with a highly respected high school diploma. 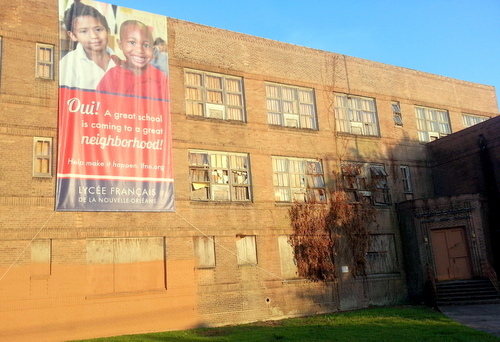 Lycée Français is projected to be the only public French curriculum pre-K – 12 school in the United States, and it is open to students from all Louisiana civil parishes.